Alistair winning for GB against the GER Juniors in Birmingham in 1982. I first saw Alistair in action when he ran for Dumbarton AAC as a Youth (Under 17) in the Dunbartonshire County Cross Country Championships at Colquhoun Park in Drumchapel in 1981 or 1982. Dumbarton had a very good group of Youths at the time – Alistair’s brother Alan (who went on to become a very good Senior athlete in his own right) and Scott Reid who won the Scottish Schools and Scottish Under 17’s 5000m track championships. Scott wasn’t in the sport for very long and Alan’s medical studies took him off the athletics scene for a bit but Alistair was always a class act and was always highly respected on the Scottish and, later, British scene. They won the West District Youths team championship twice – in 1982 and 1983. How good was Alistair? Well he is still, more than 25 years after the peak of his career in no fewer than three Scottish Ranking lists and has personal best times of . Alistair, early in his career, started training with Alex Naylor, the respected coach who was well respected throughout Britain and had coached at National level all the endurance events and had held posts at GB level for several of the. He was given the honour of the Master Coach title and attended many major Games as Scottish or British official. They worked well together through Alistair’s career. Having joined Dumbarton AAC in 1976, Alistair and Allan won club championships all the way through the age groups. Alan won the Junior Boys Championship in 1977 and Alistair won it in 1978 and 1979. In 1980 and 1981 Alistair won the Senior Boys Championship and in 1983 he won the Youths Championship. They shared first place in 1985 when they won the club Hill Race Championship. In the Senior Cross-Country Championships, Alan won in 1986 and Alistair picked it up the following year. They had been running in many races apart from the internal club events and Alistair had run in the Scottish Cross-Country Championship most years up to 1984. In 1981 he was fourteenth senior boy, 1982, nineteenth Youth (Under 17) and in 1983 he was tenth with the Dumbarton team second and in 1984 he was ninth in the Junior age group. Alistair only ran in one Edinburgh to Glasgow Road Relay when he was on the fourth stage, moving up from fourteenth to twelfth with a time of 26:40. Also on the fourth stage, running for Edinburgh University was big brother Alan who move his team from fifteenth to thirteenth and his time was 26:36. So although he held Alan off, he was four seconds slower than the pursuing Alan. However, Alistair’s main athletics focus was on the track and that’s where we will focus too. Alistair won his first Scottish track championship in 1980 when he took the Boys 800m title with a time of 1:59.1 which put him at Number One on the age-group All-Time list. In 1981, however, he had superb year as a first year Youth. He won the SAAA Youths 800m championship in 1:55.3 and in the other championship events he won both 800m and 1500m at the West District championships in 1:54.9 and 3:58.5, won the schools 1500m in 3:58.9 and won the Scottish 3000m in 8:46.6. In the rankings for the year he was top in no fewer than three events – 800 with 1:54.9, 1500 with 3:55.2 (run at Brighton in August), and Mile with 4:09.6 (run at Billingham). Oh, yes, and he was fourth in the 3000m with 8:44.6. His times for the Mile and the 1500m put him at the top of the Scottish All-Time List for his age group. (In the Mile, Hugh Barrow was second and Peter Stewart was third). In 1982 he was again a double championship winner at the West District with a 1:58.8/3:57.4 800m/1500m double but overshadowed that with the same double in the SAAA Youths Championships in 1:58.4 and 4:03.8. As far as the rankings went, he was top in both by some way – his best 800m was 1:53.9 and 3:50.50, both of which ranked him highly in the Senior ratings. In the Youths All-Time list, he ended summer 1982 with second in the 800m with 1:53.9, he was also second on the 1500m with 3:50.50 and his time of the previous year (4:09.6) kept him head of the One Mile rankings. All the time he was racing and learning his trade wherever there were the races he needed and selections for schools races, etc, had him all over the British mainland. In 1983 he started to make his mark on the Scottish scene when he was a first year Junior. In the 800m, he was top Junior and tenth Senior with 1:51.5, second Junior and fifth Senior in the 1500m with 3:49.43 first Junior in the 3000m with 8:25.69 and won the SAAA Junior 1500m. He started 1984 well with an excellent run in the Scottish Junior Cross Country team for the International Cross-Country Championships to be held in New York. This was to be his only cross-country international because of his growing specialisation on the track. That year he was first Junior and fifth Senior in the 800m with a best of 1:50.2, again first Junior and fifth Senior in the 1500 where he ran 3:42.89, first Junior and fifth senior in the Mile his 4:03.7 placed him again first Junior and fifth Senior and 8:10.09 in the 3000m placed him first Junior and sixth Senior. Top man in the Junior ranks in four events is not bad. In the SAAA Championships, he was him finish close up to the winner, John Robson, with his rival Adrian Callan third. The year ended (8th December) with a time of 3:49.1 on the Cosford Track at the AAA’s Indoor Championships which still ranks as seventh of all time on the British Junior Rankings. In July he won his first Senior 1500m championships and this is illustrated and the story told in the caption of the picture (picture from Graham MacIndoe, official photographer). The race in Oslo mentioned in the report of the Irish race, was one of the Grand Prix races which were held all over Europe at the time and the 1500/Mile races were supported usually by Steve Scott (USA), Steve Ovett, Seb Coe, Thomas Wessinghage (Germany), Sydney Maree (the South African who had got US citizenship), John Walker (NZ) and a supporting cast which included several very good athletes such as Alistair who raced in many a Grand Prix, Steve Crabb (Enfield) and others. I watched the Oslo race on television and saw Alistair tracking Walker for almost all of the race and being so delighted with his performance that I phoned his Dad, Andy, to tell him to pass on my congratulations when he spoke to Alistair! The picture below is of Alistair chasing Steve Scott in that race. The highlight of the year however had to be his breaking of the four minute mile time which he accomplished at London on 2nd August when finishing seventh in the prestigious IAC meet.. The final tally of very good times is shown in the table below with his times and Scottish and British Rankings. The reward for all of this running was selection for the Commonwealth Games to be held in Edinburgh in 1986. 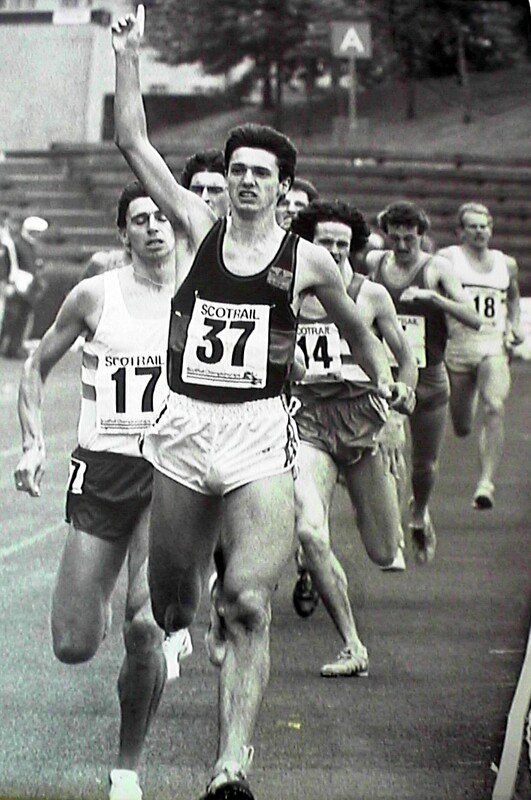 The ‘Scotland’s Runner’ magazine, first printed in June 1986 in time for the Games, said that although Adrian Callan had not qualified for the Games, “John Robson and Alistair Currie, despite injuries and exams – the latter, in Currie’s case, on the day of the National Championships which prevented his racing Callan – both scraped in by fractions. Robson indeed by a mere two hundredths of a second.” Following his racing in the previous year his running in the Games was a disappointment when he was fifth in Heat One (five places ahead of Tom Hanlon) of the 1500m in 3:44.82 and failed to make the Final. In 1986 and 1987 his name appeared in the results lists as representing Loughborough College instead of the more familiar Dumbarton AAC and the studies took precedence for the next two years. Although he still raced and ran well, it was not as often or at the same level as 1985. At the end of 1986 he ran in his club’s two-mile road race in Dumbarton and duly won it on 9:21. Alistair was always a good club man and even took part in their Glasgow to Fort William Relay, an event that was run under some very arcane rules and pre-dated the West Highland Way by more than a decade. His rankings at the end of 1986 were sixth in the 800m with a time of 1:50.60 and he stayed top of the 1500m list with 3:40.60. On 5th May 1987 he ran in the HFC AAA’s Championships and failed to qualify for the Final with his time of 3:53.67 which only placed him as fourth Scot in the event. Mind you, if you were studying hard, then May would be the worst possible month for a serious race! By the end of the year he was fourth in the rankings with 1:51.4 (in the colours of Newham and Essex Beagles) and fifth in the 1500m with 3:45.98. In the second half of 1987, Alistair started to show some signs of his form of two years earlier and finished the year fifth in the 800 (1:51.4), fifth in the 1500 (3:49.98), second in the Mile (4:01.1) and fifteenth in the 3000m with 8:26.6. Not quite as good as ’85 but getting back and with a fairly wide range of distances. 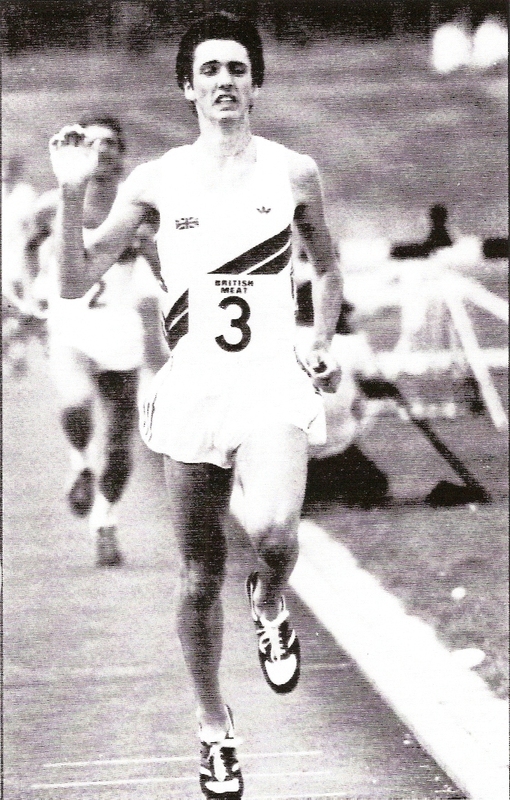 In 1988, on the 3rd July, he ran in the Scotland v Ireland v Iceland at Grangemouth and finished fourth in 3:54.24 before tackling the Scottish Championships on 22nd July. The race was reported in ‘Scotland’s Runner’ as follows. “Seeing off challenges by Alistair Currie and Gateshead’s Geoff Turnbull in the final straight, Tom Hanlon shaded his 1987 time by 0.15 seconds to retain his title. A slow first two laps (63.85, 64.10) ensured the field stayed together but with 250m left Hanlon made his move and with the last lap run in approximately 55 seconds neither Currie nor Turnbull had the extra acceleration to get past him – and Currie paid for his bid by losing third place to Adrian Callan. Result: 1. T Hanlon 3:47.43; 2. G Turnbull 3:47.79; 3. A Callan 3:47.88; 4. A Currie 3:47.89.” What a finish, the top four were separated by less than half a second with only one hundredth between Callan and Currie! Later that year he turned out in another race with a very close finish – the BMC Invitation 800m at Crown Point, Glasgow, organised by Lachie Stewart. The result was a win for Tom Ritchie with Alan Murray second in 1:52.6, Glen Stewart third in 1:52.6 and Alistair fourth in 1:52.8. With a best time for the year of 3:44.31 for the 1500m he was third ranked behind Hanlon (3:38.59) and Callan (3:41.12). 1989 started with a bang! The same issue of ‘Scotland’s Runner’ published the Scottish All-Time Ranking Lists and Alistair appeared in no fewer than four of them: 800m (19th with 1:49.01 which eh ran in 1985), 1500 (seventh in 3:49.43, again run in 1985), One Mile (fifteenth with 3:59.29 in 1985) and 3000m (7:55.85i in 1989). The stage seemed set for a good summer season. That 3000m run however was good enough to have him selected for the British team at the European Indoor Championships at The Hague in the Netherlands which was won by Dieter Baumann (FRG) in 7:50.3 with Abel Anton (Sp) second in 7:51.88 and Jackie Carlier (Fr) in 7:52.33 and Alistair out of the medals. 1990 also started well indoors when on 25th February in Kelvin Hall he ran in the 800 and 1500m as a guest in the Scottish District Select v Scottish Schools v Loughborough v Birmingham where he finished first in the 800m in 1:53.56 and second in the 1500m in 3:48.23. In the rankings published early in the year he was second in the 800m, second in the 1500m with 3:45.26i and fourth in the 3000m with 8:01.10. This was a period when there were several non- Scots living in the country or even some living outside Scotland but with recently discovered qualifications to represent the country. Thus in the 1500m rankings, although he was ahead of Tom Hanlon, the list was topped by Ian Hamer of Wales, and two of the three in front of him in the 3000 were Hamer and Peter McColgan of Ireland. However when the SAAA West District Indoor Championship took place, there was no Alistair Currie in any of his three events. He did compete in the outdoor Scotrail National Championships on 27th July at Crown Point in Glasgow he was fifth in 3:49.18. Again there was the usual quantity of non-, or even new, Scots leading the field. The finishing order was 1. T Hanlon 3:47.69; 2. Larry Mangleshot (Woodford Green); 3. Davie Wilson (Ireland); 4. F Weigan (Holland); 5. A Currie 3:49.18; 6. Steve Ovett 3:51.68; 6. Adrian Callan 3:53.22. Nevertheless, a fit and well Alistair Currie was well capable of beating the winning time and a run of almost 3:50 was nowhere near his best. It is fair to assume that he had been injured between his excellent start to the year and the SAAA Championships. His competitive appearances became fewer in number although in 1992 running in the colours of Newham and Essex Beagles he was ranked in the One Mile (4th with 4:09.4) and in 1993 in the 3000m (19th with 8:24.61). I’d like to finish with a story about Alistair on a trip with a Scottish representative squad to Birmingham. After the match, the coaches were sitting in the Hotel Bar prior to heading up to get washed and changed for dinner when Alistair and a friend came in. he went up to the bar and asked the dragon behind it for “Two Citrus Springs, please.” Citrus Spring was a fairly popular fruit juice. The dragon poured them into a single glass and Alistair requested that it be put in two. “You didn’t say you wanted separate glasses!” And in his usual quiet fashion, he said, “If I asked for two pints of beer, you wouldn’t have put them in a single glass, would you?” After muttering something like don’t get funny with me she put them in separate glasses. Although one of the quietest and most private of athletes, this illustrates his nice droll sense of humour. He had graduated from Loughborough College in 1988 with a degree in PE, Sports Science and Recreation Management. He was also Sports Manager for two years for Mansfield District Council and then spent eight years working for Reebok as an athletics consultant. After five years in the charity fundraising sector, he came back to work for Scottish Athletics in the important jogScotland Manager. Having been in the sport since joining the local club in 1976 and having had a wonderful career during which he raced all over Europe against the best in the world at a time when his chosen events in Britain, Europe and the world were at an all time high, having run in the Commonwealth Games, the European Indoor Championships and won Scottish titles at all age levels, his career now came first. As with his brother he bowed out of the spotlight when he realised that.